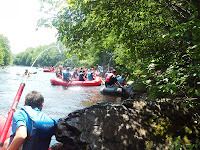 Troop 122 would like to invite you and your family to come out and enjoy a fun filled summer day at our whitewater rafting trip at Whitewater Challengers in Weatherly, PA (map). 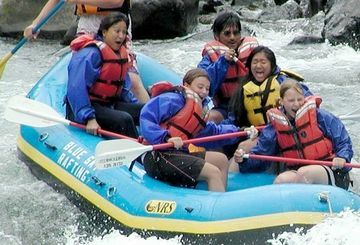 This rafting trip boasts some terrific scenery and adrenaline pumping Class II and Class III rapids! This is as good as it gets on the Lehigh River. On river time will be 3.5 – 4.5 hours. The cost is $53.00 per person which includes mandatory insurance, all necessary rafting equipment, guides and shuttle. There will be a stop along the way to eat lunch if you want to bring a brown bag lunch or snack. There will be optional camping with Troop 122 on Saturday August 10th thru Sunday August 11th. The cost will be $5.00 per person. The campground has modern facilities such as showers and flush toilets. This is a great place for first time campers as well as seasoned campers. There will be an optional Troop 122 Dinner & Breakfast Meal Plan which will cost an additional $10.00 per person. This includes burgers, dogs, chips, drinks,etc for dinner and bagels, muffins, juices and coffee for breakfast. Rafting trip is rain or shine. If you are not camping on Saturday, then you must arrive at Whitewater Challengers by 9:50am on Sunday or you will miss the bus!